Yesterday we participated in the Morristown Festival of Books and we will be posting photos of the event in a few weeks. It was one of the best organized book events of my memory. We gave a talk in the Morristown Church of the Redemption to a group of enthusiastic book lovers who asked thought provoking questions which prompted fun stores and informative responses. The wind and rain did little if anything to dissuade people from coming (900 people bought tickets to the events). Afterwards we signed books in one of the nearby tents. One of the people in the line had a story he had been waiting for years to tell me and it was so moving if he puts it in writing I will post it. In 1988, at the start of his career, Mark Levy (not a relative but who knows!) was working at a bottom entry level position in the distribution center of book seller B. Dalton. When he saw the newly published Cake Bible and noticed that it was being overlooked by the powers that purchase, he suggested that this book would be a major seller. They ordered 35 saying that if they didn't sell his neck was on the block (ok they used the a word). The rest is history. 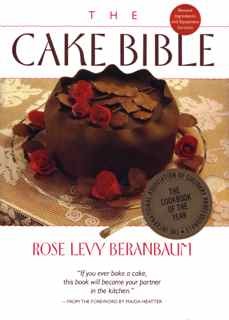 And this coming November, The Cake Bible will be 27 years old and in its 52nd printing. Mark Levy said the book changed his life and gave him the courage and confidence to apply for major positions in places including the United Nations. I do hope he will send me the rest of his story as his career is an inspiration.